Super strong. Super fast. Super young! When Andrew Ryan accidentally inherits the strength and abilities of his superhero idol, Defender, his dreams may have just come true. . . . or NOT. Fighting crime isn’t easy when you’re in the fifth grade, and it takes a lot more than superpowers to be a hero. The Boltons provide easy-to-follow panels filled with action, wide eyes, banter (“Not another step or it’s bye-bye puberty!”), and comically exaggerated differences between the puny (looking!) caped crusader and his much buffer adversaries. ... Three cheers for the underdog. The character is full of pluck that is true to a ten-year-old’s spirit while keeping older readers entertained. Readers will cheer for him as he goes through his days. The illustrations are well-drawn in traditional superhero comic book style. ... This title is perfect for elementary and middle school boys, especially reluctant readers. SMASH pays homage to the genre while adding tweaks that make it all feel fresh. 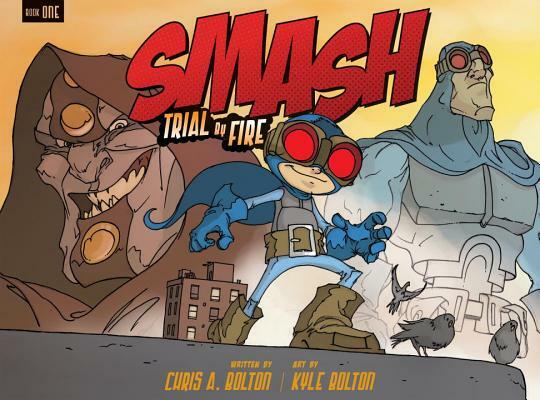 This is sure to be a draw for superhero fans and reluctant readers alike. Kyle Bolton’s cartoonish art recalls Frank Cammuso’s (The Misadventures of Salem Hyde, 2013), but it has a refreshingly everyday color palette. There is violence (it’s a superhero story, after all), but it is appropriate for the intended audience, and the ending leaves plenty of stories to tell in subsequent volumes. Full of drama, humor, and seriously thrilling action sequences. To summarize: kids are going to love it.